Mrs. Delois W, Walker & Bishop James B. Walker. Bishop James B. Walker is a native of Boley, Oklahoma. He is married to Delois Woody-Walker and they have two daughters and one grandson. Bishop Walker is the Presiding Prelate of the Seventh Episcopal District of the Christian Methodist Episcopal (C.M.E.) Church. Bishop Walker was elected the 56th bishop of the C.M.E. Church at its thirty-seventh General Conference, held in Mobile, Alabama. He was the first of five new bishops elected including the denomination’s first female bishop as well as its first indigenous bishop for Africa. As former pastor of Phillips Metropolitan CME Church in Hartford, Connecticut for 27 years, he brings extensive pastoral experience. He led the congregation through many years of numerical and spiritual growth. During Bishop Walker’s administration, the congregation acquired and renovated the Phillips Metro office complex and constructed its new worship center on 2500 Main Street in Hartford, Connecticut. 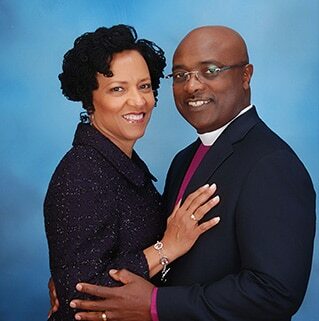 Bishop Walker has also served as interim Presiding Elder of the New York-New England District, as well, and the pastor of Trinity CME Church, Toccoa, Georgia and Sykes Memorial CME Church in Oklahoma City, Oklahoma. Bishop Walker is a former President of the Greater Hartford Interdenominational Ministerial Alliance as well as the former Interim Dean and Adjunct Faculty at Hartford Seminary. He is the founder and first Executive Director of the North Star Center for Human Development, Inc. and through his leadership, North Star was awarded a HUD 202 grant to construct the Phillips Metropolitan Apartments (a 40 unit Senior Housing Community). Additionally, Bishop Walker collaborated with the State of Connecticut Department of Children and Families to form a faith-based adoption and foster care ministry, the Queen Esther Ministry. Bishop Walker served as Co-Chair of the Interfaith Fellowship for Universal Health Care, a faith-based organization responsible for passing Connecticut’s landmark Health Care for all legislation (Sustinet) in 2009. He was a member of the Community Advisory Board for St. Francis Hospital and he was appointed as a Commissioner on the City of Hartford Planning and Zoning Board. Bishop Walker is also a former member of the Hartford Democratic Town Committee (7th District). Bishop Walker is a graduate of Langston University, Langston, Oklahoma and he received the Master’s of Divinity degree at Phillips School of Theology of the Interdenominational Theological Center in Atlanta, Georgia. He is a member of the Alpha Phi Alpha Fraternity.